For the past month, the Street Smarts exhibition at the East End Studio Gallery has showcased Alex Barber’s eye-catching photographs of the Houston underground art scene alongside original work by local street artists. 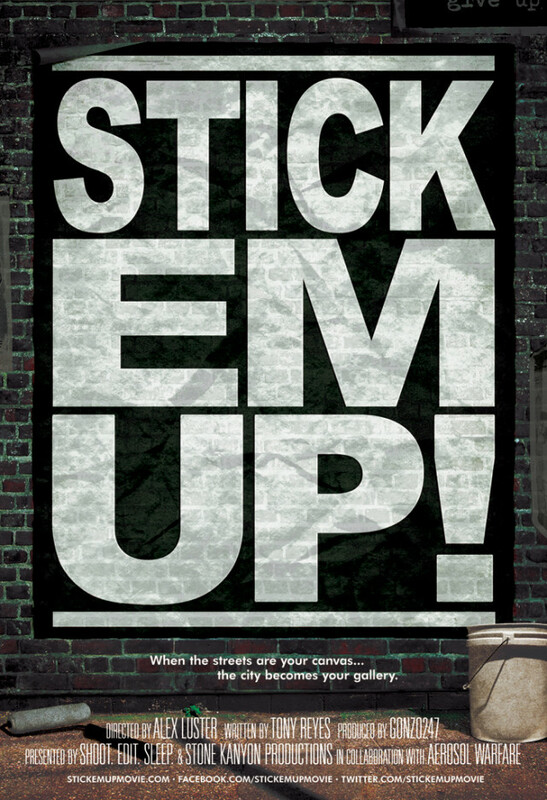 To mark the closing of the exhibition, East End is holding a special screening tonight of director Alex Luster’s 2012 documentary Stick Em Up! Stick Em Up explores Houston street artists’ use of wheatpasting, which involves plastering images on walls, call-boxes, and billboards to catch the eyes of people on their daily commute. This poster-based art form requires a hefty time investment by artists whose work risks being erased in a matter of minutes by law enforcement. Producer GONZO247 and screenwriter Tony Reyes helped turn what was initially a small project on the Houston artist known as Give Up (famous for his razor-blade posters) into a 75-minute examination of an underground art movement sweeping the country. Stick Em Up tells both sides of the street art story, interviewing artists such as DUAL, Eyesore, and Shepard Fairey (the creator of the famous Obama “Hope” poster), who churn out their posters at alarming speeds, and the city officials who hope to erase their art, if not prevent it from being made at all. The film is presented by Shoot. Edit. Sleep. and Stone Kanyon Productions in collaboration with Aerosol Warfare.